Why not let an experienced plumber handle the radiator valves repair and replacement for you? Many homeowners nowadays are replacing their manual radiator valves because they provide better energy efficiency. Sometimes the reason to replace the old valve is merely the fact that their design doesn’t fit the renovated home interior. Whether you have to deal with a faulty radiator valve or you need to replace the old one, we at Handyman Near Me can help you! Handyman Near Me can repair and fit the radiator valves in your property and help you cross this task from your to-do list. Our experienced handymen have hands-on experience in various plumbing jobs and can help fix the water fixtures efficiently and on time. Take advantage of our same-day bookings and get a radiator valve repair or replacement service by the best plumbers in London! 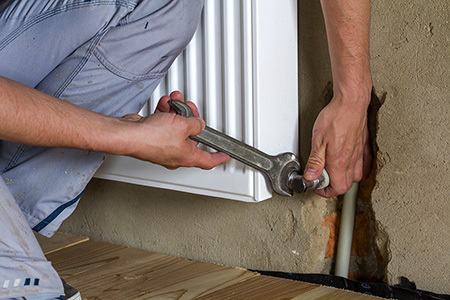 Handyman Near Me will provide you with a fast and high-quality radiator valve repair service. Be it a leak or difficulty when turning the knob, our skilled handymen will source the problem and fix it. We can also help you with radiator valves replacement – the technicians will remove the old and fit the new ones in no time. Our skilled professionals can also fix dripping faucets, leaky taps, repair and replace shower valves and fixtures. The handymen will bring all the plumbing tools and equipment necessary to repair or replace the radiator valves in your property. We also provide last-minute bookings to help you deal even with emergency issues such as leaks or pipe fitting.